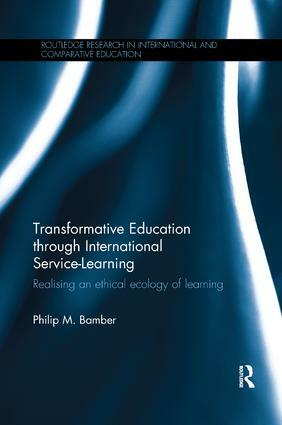 In this finely conceived and elegantly structured book Philip Bamber brings an international perspective to bear on the notion of learning as a transformative process that combines reciprocity and dialogue with a willingness to recognise our cultural differences. It is, argues Bamber, only through this process of learning together across local and global divides that we achieve ethical agency in respect of our own life trajectories and moral agency in relation to our treatment of one another. This is an important and timely work that has implications for how we conceive of educational practice in a global and increasingly divided world. Honorary Professor of International Education and Lifelong Learning and Senior Research Fellow, Centre for Lifelong Learning Research and Development, Hong Kong Institute of Education. The sterile, utilitarian policies and practices that characterise contemporary education neglect the power of learning to change lives fundamentally. In this important book, Philip Bamber demonstrates how International Service-Learning offers an alternative approach--one that can truly transform individuals and mitigate the cultural misunderstandings, social divisions, environmental degradation and other by-products of the complex globalised village we inhabit. The discourse on international service learning is taken to a new conceptual level through this important publication. Through an analysis of theories of transformative learning and examples of practice in higher education, and use of the concept authentic, it provides an important contribution to the growing body of literature in and around global citizenship education. This important book contains insightful messages regarding the ethics of International Education and adult education more broadly. It draws upon an impressive range of theory to develop our understanding of transformative learning as it links to the notion of authenticity. The findings of this research, which include a novel definition of International Service-Learning, are timely and pertinent for researchers and practitioners in North America and beyond. This book is a major contribution to the conversation about Transformative Learning in a multi-cultural, global context. The focus on being as well as knowing, on self as well as self-in-relationship, is powerful. The critique of International Service-Learning in terms of the apparently unwitting reinforcement of colonization and ignoring systemic causes of is discerning and useful. Weaving the ethics of virtue into the discussion of transformation is profound. I was moved and inspired by this work. This is a timely and compelling book that offers faculty, researchers and practitioners a richly layered and deeply theoretical framework for understanding the complex process of transformative learning. The expanded conceptualization of transformative learning as a multidimensional and relational journey of becoming an authentic self, derived from a longitudinal study of students’ international service-learning experience, is unique and powerful." This publication brims with compelling insights into the pitfalls and possibilities of international service activity and the essential conditions for this to be a transformative learning experience. Philip Bamber has provided a richly detailed map of the ethical and educational challenges of international service activity and a reliable compass to help practitioners and advocates to navigate these. Dr Bamber’s new book uses theoretical as well as empirical evidence about transformative learning through international volunteering. It reminds us what may go wrong and how volunteers may do more harm than good if they are not aware of the social complexity of the community in which they are working. This book provides conceptual tools to assist students, practitioners, researchers and non-government organisations who seek to ‘get out’ of their current ways of thinking and act as global citizens. It highlights the importance of ‘getting in’ to where they are going through reconnecting, immersion and gaining a felt sense of the worlds of others. The author identifies the important conditions of ‘connectivity with’, ‘openness with’ and ‘anticipating reciprocity’ as capabilities required by educational researchers seeking to challenge social injustice. VMM: International Volunteering and Development (VMM) has a long and rich history of working in partnership with those communities that are socially, economically and politically marginalised in order to help create a more just and equal global society. At a time of deep reflection and change for VMM, Philip Bamber’s unambiguous linking of learning and community development to the creation the ‘authentic self’ has reaffirmed our own mission and so we can state without reservation, that this book is an invaluable tool and reference for any organisation like VMM with a vision for "a world where we live in the shelter of one another" and a mission "to share who we are not just what we have". This book provides a timely and much-needed exploration of the many potentially problematic aspects of International Service Learning. Philip Bamber looks beneath the stated aims of such programmes to address issues of social injustice and poverty to question the ethical and educational problems underlying them. What kind of learning really emerges? What is the nature of the power relationships between different players in an International Service-Learning programme? In what ways might such programmes have the potential to propagate a form of new colonialism? He develops an ‘ethical ecology’ through which these challenges can be approached and a more authentic transformative learning promoted. We look forward to using the book as a stimulus for conversation in the on-going re-envisioning and revising of our own programmes in Ireland. This first class book provides insight into the power of international service experiences to have an impact lasting well beyond their duration. With international service set to increase in the UK and beyond, it’s important we understand more about its effects. This book will be of interest to anyone involved in applying education to help create a more just and sustainable world. This book is being published at an important time for international service learning: a time when opportunities to travel and experience other places, for some students, are unparalleled, yet the implications for them and for host communities are dangerously under-theorised. I wholeheartedly recommend this publication. This book is a fascinating intervention in the debate around the practical role of educators in the global development process. It maps out the potential for development education within the context of the Sustainable Development Goals and highlights the importance of interdependence in the linkages that can be nurtured through educational contact. Crucially, it concludes with a series of very helpful suggestions on the development of what is termed an ‘ethical ecology of transformative learning’ and with this it gives education for social justice an essential platform. Part 1: Transformative Learning Towards an Integrative Model of Transformative Learning. The Knowing, Being and Doing of Transformation. The Centrality of Authenticity to Transformative Learning Part 2: International Service-Learning Key Concepts and Practices in International Service-Learning. The Student Experience of International Service-Learning Part 3: Transformative Learning as the Process of Becoming Authentic Authenticity as Selfhood: Becoming Oneself [Integrity]. Authenticity as Reciprocity: Becoming Persons-in-Relation [Recognition]. Authenticity as Worldliness: Becoming Other-Wise [Cosmopolitanism] Part 4: An Ethical Ecology of Transformative Learning Towards an Ethical Ecology of Transformative Learning.